This is the next in the Series of reviews on the narrative gaming aspects of the battle tome books. By this I mean the battle plans, Path to Glory tables, battalions etc. If you are looking for more of a competitive gaming low down, I would recommend listening to FaceHammer and if you are looking for more of a background aspect, Mengelminiatures.com would be your best point of call. Firstly, before I delve into the gaming aspects, I wanted to touch on the background to the book itself. If you haven't read it, do it, it is a great fresh take on a Faction that although received no new models, has been made viable and rich in story with some genius writing. The background covers how the Beastclaw tribes are forever being chased by the EverWinter because of a pact they made in times old. 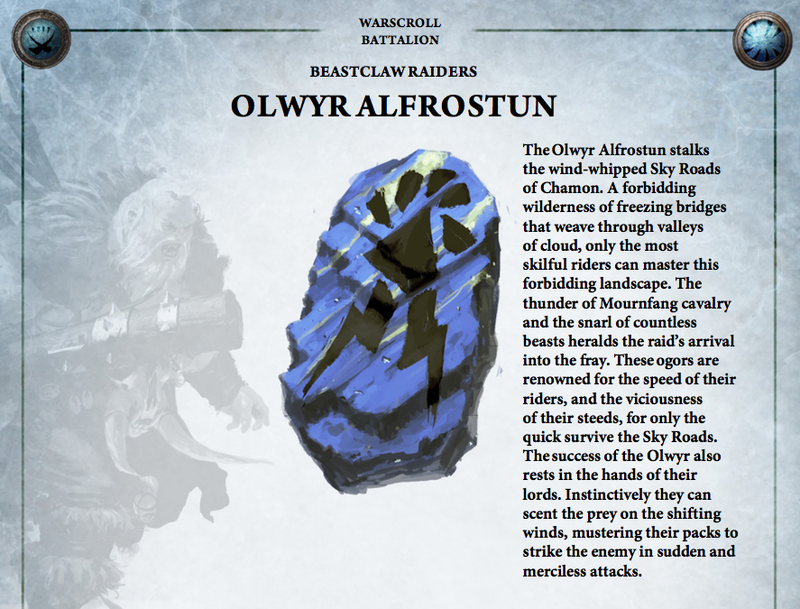 The Tribes or as they refer to themselves AlfroStuns are broken down into various packs, from large bands of the Jorblad to the smaller warbands led by Hunters, all options give you a great way to start an army of Raiders. The book has some great visualisations of how to go about painting your tribes. 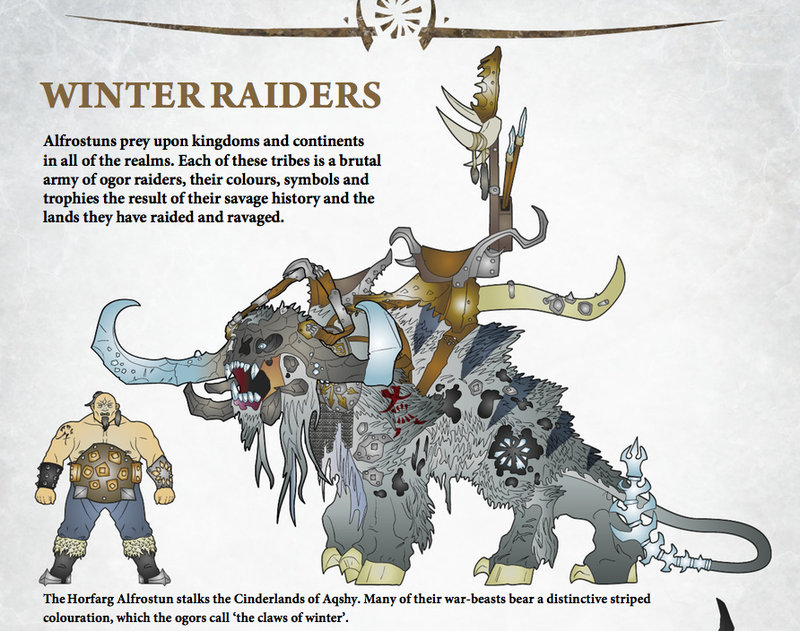 From Winter Raiders to the colour schemes of some of the Afrostuns. you will find your inspiration here, if like me, you choose a paint scheme before looking at the rules, here is where you will find it. The Beastclaw models you see in the 'Eavy Metal section and on most box art show the Ogors have tattoos, a great way to make your tribes unique, this section has a few paint splatters on how to achieve these effects easily and quickly! One great thing about this battle tome is you get 3 new battle plans to play with your Beastclaw. These are always my favourite part of the Battletomes. It gives you the flavour of how your army will play on the battlefield, gives you opportunities of practising and perfecting your way of playing with your chosen warband. The first in the book is called A Feast of Plenty (What a great name), the objective for the Beastclaw is to fill your bellies with the culinary pleasures of the objectives! The Protectors objective is defend the site and keep your larder safe. A great fun battleplan with a cool story behind it. The objectives are found in the terrain pieces, The Raiders are tasked in searching terrain pieces and eating the tasty morsels, the more they devour the more chance they have of a Major Victory. In this next battleplan, Ensnared. 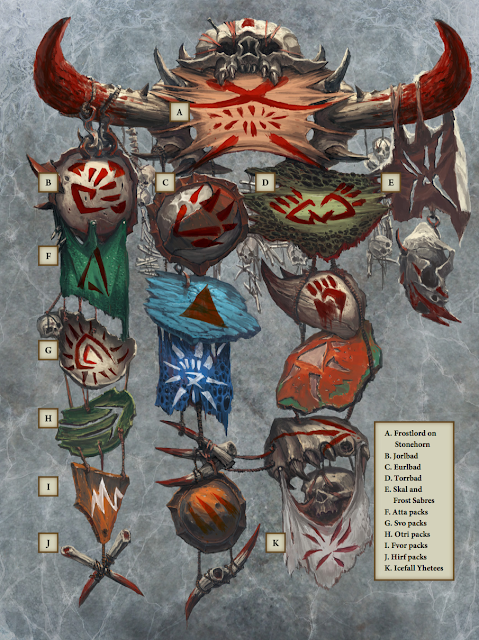 Shows you how the Allegiance abilities and some of the characters special rules work. The objective is to kill the enemy! The enemy suffer greatly from the effects of the EverWinter, and as such it causes them to move and hit more slowly in the battleplan, the longer the battleplan goes on, the more the enemy suffers. But the Custodians have defended these lands for a long time, they have a source of power in their possession which allows them to heal in each of their Hero phases as long a the General is still alive. 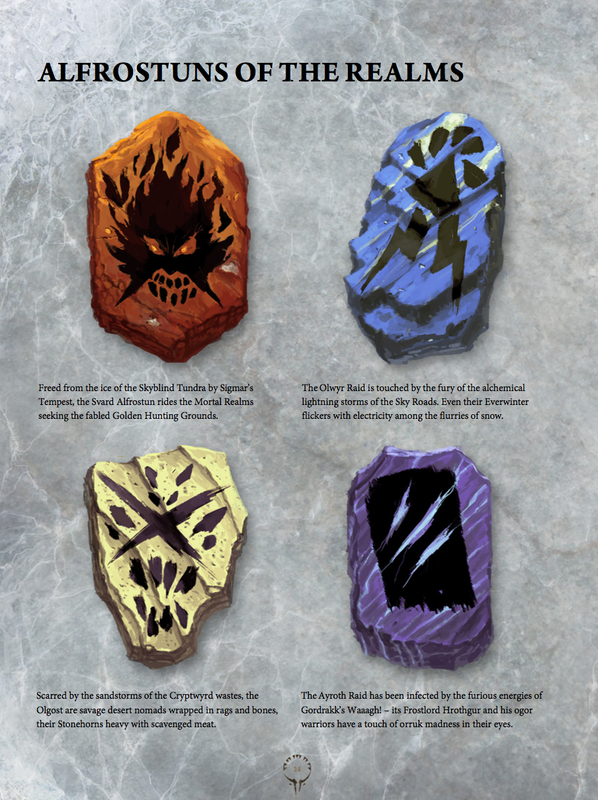 The final battleplan in the book is a great representation of the background in the book. 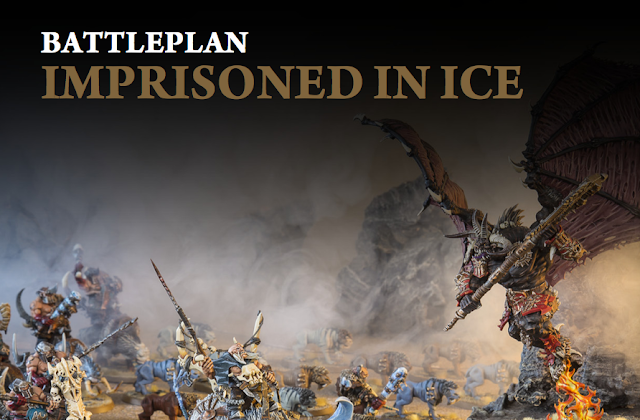 The Quarry (enemy army) has been trapped in an ice prison, a tactic used by Beastclaw often, now they are awaiting their doom. 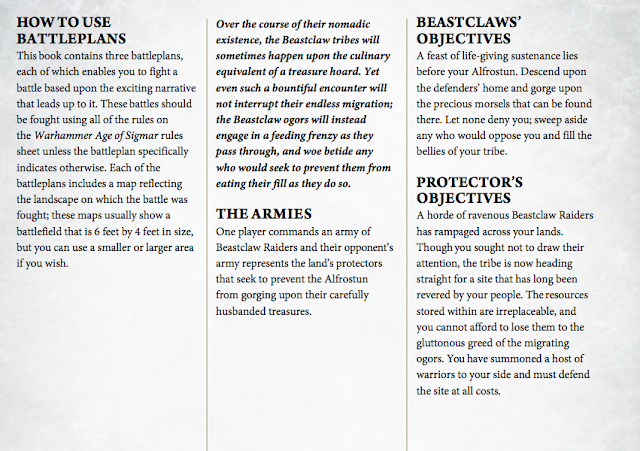 The Beastclaw will strike, but from what direction, only they know. 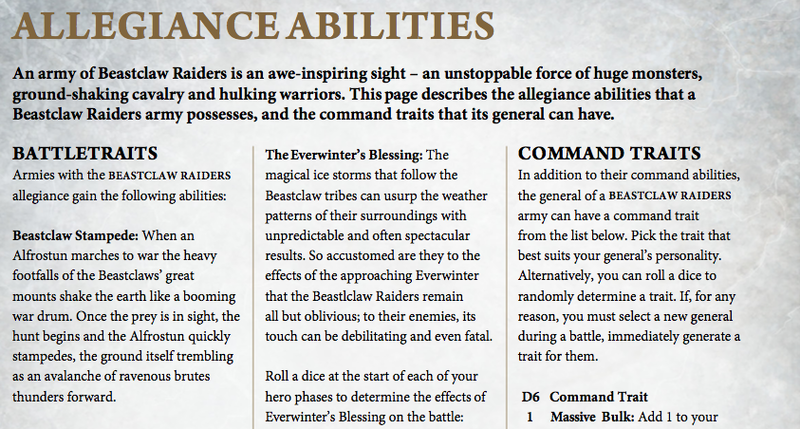 There are special rules for the enemy freeing themselves and special deployment rules for the Raiders army. The objective for the Beastclaw is to wipe out the enemy, for the Quarry, just stay alive and you'll win. As I mentioned in the Stormcast review, if you have read it. The allegiance abilities are where the real narrative of the army comes in. Here you get to customise your General with a Command Trait to show what kind of army he leads, you also get to equip your Heroes with artefacts too (perfect opportunity for your actual customisation of your models themselves. It is here where I always look first as it may decide on which units I include in my army. If for instance my General has a Command Trait that allows him to move quicker, then I would include lots of Mournfang and Sabres etc. 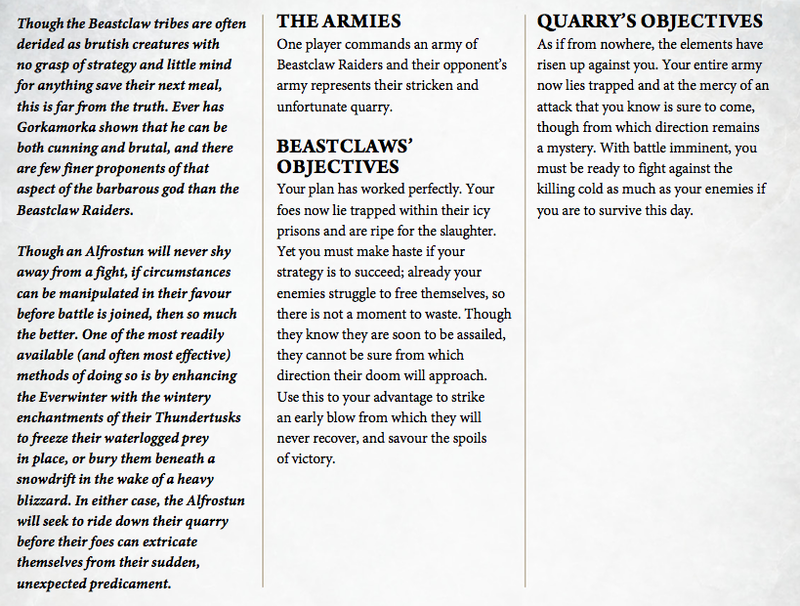 You do also gain some more artefacts if you have magic users in your army which could define how your army plays. This table along with the battalions shows how your army is made up, with Frostlords at the top and the heiracy below. The first lot of Battalions are there to explain how the Afrostuns are made, but below I have shown an example of the great options for mixing into other factions. 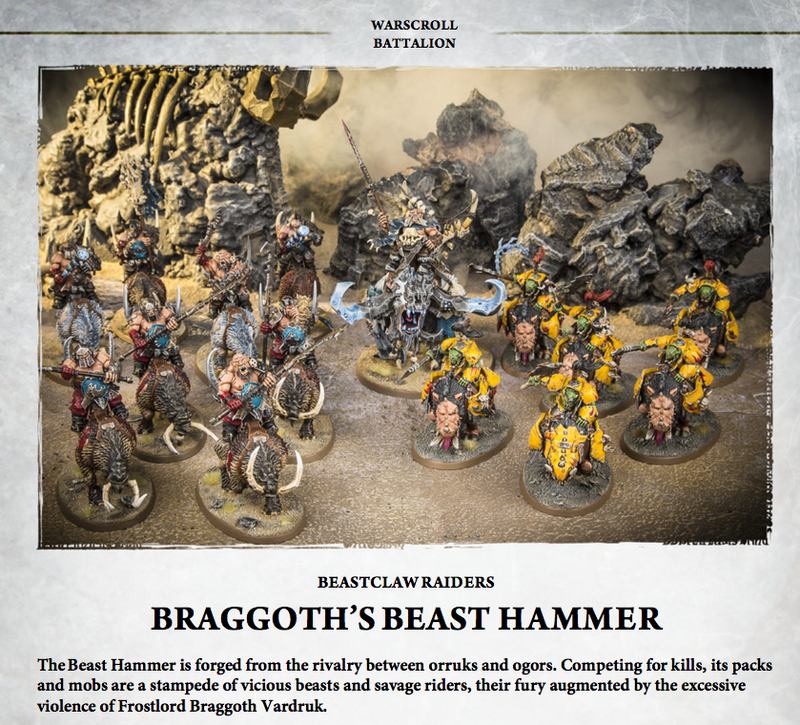 This battalion is based on a 'Real' historic story with Ironjawz and Beastclaw in competition with each other. 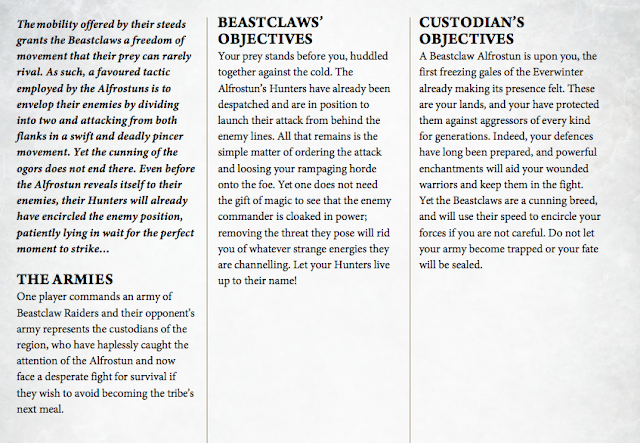 The rules for it are great and it could make for a fantastic themed army. 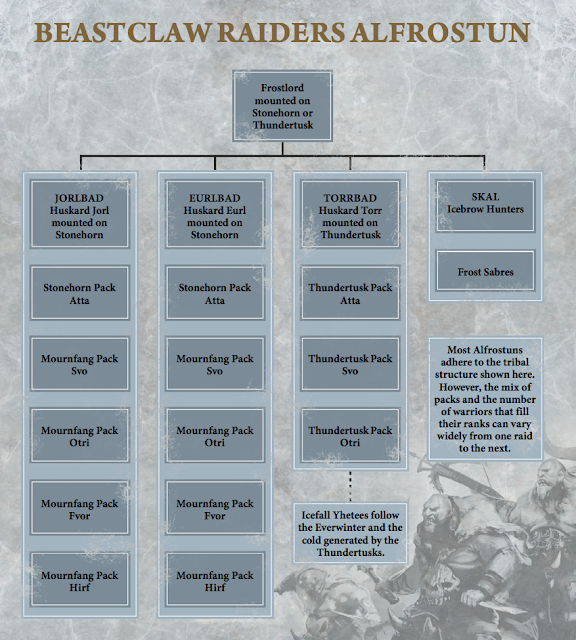 Finally, the options for the larger battalions are listed too, which give options for combining smaller battalions to make a unique Alfrostun and gaining additional abilities in the process. 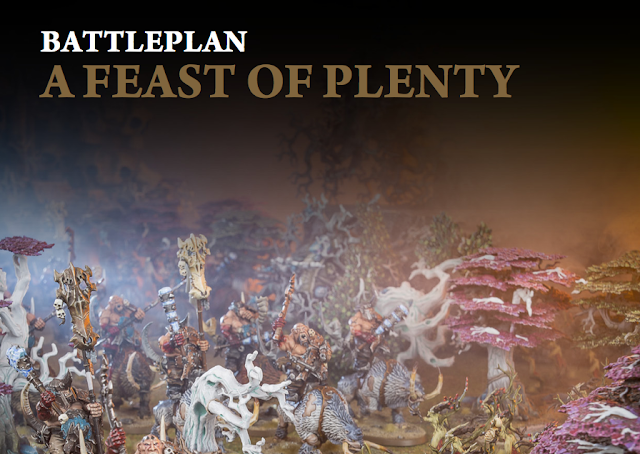 The only unfortunate thing about the book is the lack of Path to Glory, which hopefully in the upcoming release of the supplement will be addressed, all in all though it is a great battletome. The flavour of the army is really unique and on the tabletop it sure does pack a punch. Fun battle plans make this an excellent buy if you collect the army. Let me know what you think of the book too.